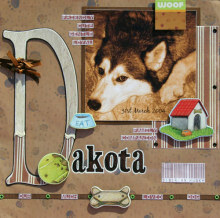 Chipboard is a great way to add dimension to any page. With this layout I have chosen to go with a primarily brown colour scheme using a sepia photo to enable the colour of the chipboard embellishments to stand out from the page. This layout was created using American Traditional Paw Prints paper, reverse side of Scenic Route Harvest Big Multi Daisies paper, Paper Pizazz sandstone paper, brown cardstock, Rusty Pickle "D" monogram, Making Memories "mixed font" foam stamps, black versacolor ink, versa mark ink, embossing powder, white gel pen, black pen, light/dark brown ribbon, cream ric rac, black/ green Heidi Swapp eyelets, journaling created using "Dymo" & "Barcode" fonts and American Traditional Dog Chipboard. Cut a rectangle of each patterned paper just larger than area to be covered on the "D". Apply glue to the top surface of the "D" and adhere the patterned papers one above the other so that their edges connect. Allow the glue to dry. Trim excess paper away from around letter leaving approximately a 3-5mm overhang. Using a sanding block, sanding stick or sand paper, gently rub along the edges of the letter to remove over hang. Work from front to back to avoid peeling the patterned paper off. For a distressed effect lightly sand front of monogram. Cover the joins between the two patterned papers with cream ric rac and decorate with ribbon. Set aside and move on to the rest of your page. Use American Traditional Paw Prints paper as your background. Cut a piece of brown cardstock for mounting photo and distress the edges by applying versa mark ink. Cut a rectangle from the striped paper. Distress by lightly sanding the edges and top surface. Mount photo onto patterned paper and cardstock in the top left corner of your page. Place "D" onto the left side of your background paper. Lightly mark positioning for stamped lettering next to it. Stamp and emboss title, using a heat gun to heat set embossing powder. Outline title with white gel pen. Outline monogram in black pen. Set black eyelets to striped patterned paper, as shown on the layout above. Attach brown ribbon across the bottom of the page, approximate 2cm from the bottom edge. Set green eyelets at equal distance along ribbon. Using a computer program such as Microsoft "Word," make journaling tags in "Dymo" & "Barcode" fonts (these can be downloaded from the internet). Print in brown as individual words and trim to shape. Attach them to your page, as shown above. Finally, position and adhere American Traditional Dog Chipboard shapes on to layout as shown (these shapes are self adhesive).